Post Mount Personalized Sign - - 15" x 15" cast aluminum property information sign. Custom made with your choice of color combination and desired wording. Made in USA. You will need to furnish your own hardware depending of the type of post or pole you are using. Screw holes are 14.5" center to center. Wall mount style includes hardware. Line 1 holds up to five (5) 4.5" characters. Lines 2 & 3 hold up to twelve (12) 2" characters each. 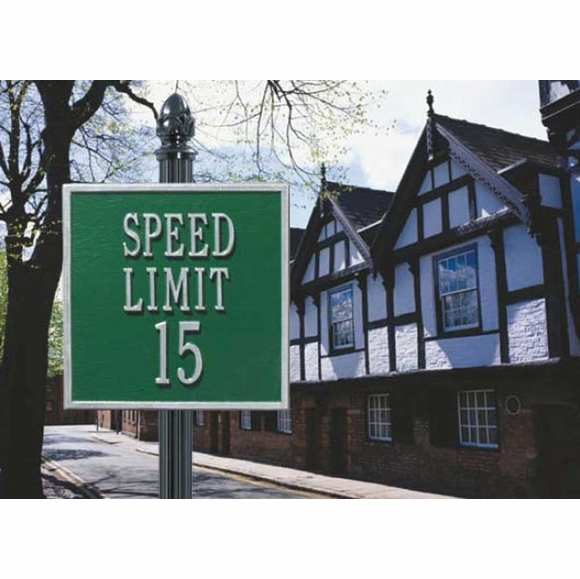 NOTE: If you order a Speed Limit sign as shown above, we can produce it with larger characters on the bottom line. YOU MUST NOTIFY US IN THE COMMENTS AREA OF YOUR ORDER FORM IF YOU WOULD LIKE LARGER CHARACTERS ON LINE 3. Often purchased by a homeowner's association or builder to use in common areas or throughout a community. Perfect for a neighborhood cul-de-sac or drive leading to a country club, restaurant, or event venue. Also suitable for a private homeowner. Alternate traffic warnings you might consider: Watch for Children; Hidden Driveway Ahead; Speed Bumps Ahead; No Through Traffic; Slow / School Bus Stop / Next Block.